My favourite shop Babipur is encouraging us all to be mindful with Mandalas at the moment so I thought I’d do a wee post about how much fun we’re having making them! Spiritually, mandalas have been used for generations as a way of focusing and/or alongside meditation. Traditionally, there is a focal point in the centre and then repetitive patterns radiating out forming a circle. I think taking a moment to focus on something pointlessly pretty, even for a minute or two is a great idea. The art of Mandalas comes from their therapeutic nature. The deliberate positioning of different textures, shapes and colours is incredibly soothing. Repetitive patterns forming intricate designs are simple and satisfying for children and adults alike. Mandala making could easily replace the adult colouring book trend methinks. Also anything that will get my boys to sit still for 2 minutes is a win in my book! 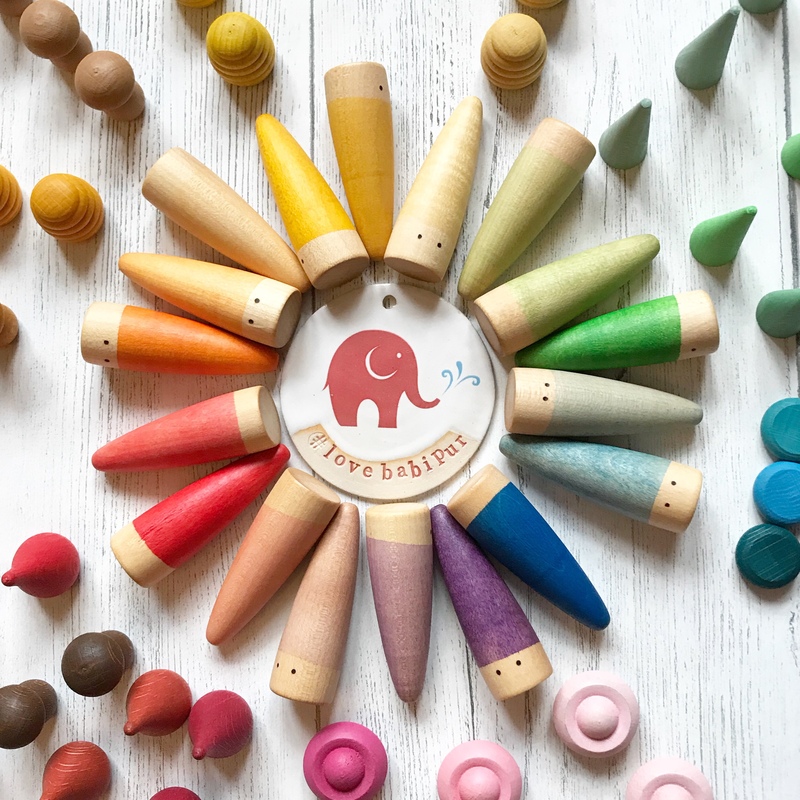 One of our favourite brands Grapat have recently released a whole range of Mandala pieces or loose parts. They are the perfect addition to any house hold to encourage and enhance unstructured play. They are also brilliant to tinker around making mandalas with! Taking a couple of minutes to make one is good for the soul and reminds us to be mindful. Mandala making is brilliant as quiet wind down activity for children. I think it is really important that I can teach my boys to be mindful too. There is no right or wrong with mandala making so once you’ve started they just kind of evolve organically. We’ve embraced this and created all sorts of designs this week! We’re in the middle of the Easter holidays here so having a basket full of Mandala making pieces has come in particularly handy. The boys and I have been having fun making different mandalas each day using whatever we can find. It is brilliant that mandala making can be so quick sometimes because I can set them to task while I get the washing on or sort the dinner. More often that not I’ve just left the dishes and joined in! We’ve recently added a Grimms Magnetic Tin to our stash and we’ve been having a blast with this already; making patterns, shapes, faces and Mandalas. This is nice and portable, perfect for the car or out and about. Also handy to be able to give to one of my 3 boys for a spot of quiet time away from his siblings! As you can see rainbow themed mandalas are definitely a firm favourite in this house. We love using our brightly coloured and chunky Grimms building blocks and sets on their own or mixed and matched with Grapat Nins, Bajo Mendelsons and other random things we find round the house! Mandalas are great logical problem solving type puzzles for children too, they can learn what fits where and what fits best and it is definitely helping mine learn how to go with the flow! We also love to use the wobbel360 as a base for a lot of them too as we can all sit round it on the floor and as it can rotate freely on the carpet (think lazy Susan) it’s perfect for us all to create mandalas together as a family. It’s also a lot of fun spinning it round after we’re finished to destroy them – the chaos after the calm! Mandalas don’t have to be made with children’s toys – they can be made with literally anything. We recently went to the beach and took our Plan Toys crab magnifying glass. It came in handy after we made an all natural mandala with shells, seaweed, sea glass and rocks. We were able to get a closer look and have a good nosey at all the random things we found! My friend, the lovely Heather from a Reusable Life created this stunning mandala in her garden with some fresh flowers! I’m incredibly envious of the better weather they’re having but so inspired to try something like this myself… well when Scotland finally embraces Spring and lets the flowers bloom! Babipur have started using the tag #babipurmandala on Instagram and it is wonderful to see so many beautiful creations ranging from stunningly simple to completely insane popping up on my feed. Feel free to join in – mainly so me and the boys can go snooping for inspiration!